Great for transfering liquids specially for Modeling Tool. 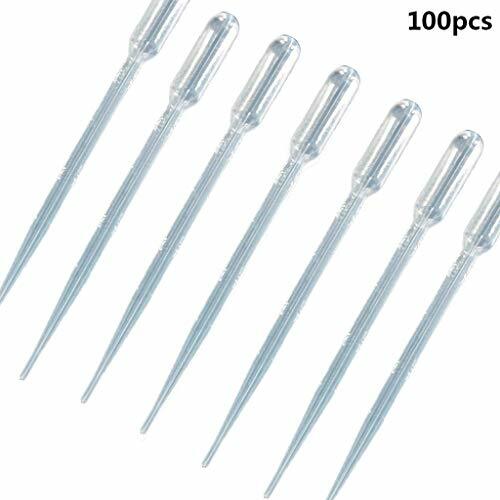 Soft, pliable and easy to use,these pipettes could save your time. It is essential to weigh a lot of liquids little by little. Disposable items, please refrain from reuse. This 250mL Corning Pyrex graduated buret is suitable for use in school and institutional laboratories not requiring the accuracy of our Class A model. Buret is used for dispensing large volumes of liquids rapidly and accurately. Made from close tolerance, accurate bore tubing with uniform walls, this buret has a permanently colored scale. Equipped with a PTFEstopcock plug to reduce freezing and eliminate lubricant contamination. The smooth micro-finish of the stopcock barrel assures a precision fit and optimum leak-resistant performance. Material: Borosilicate Glass Code 7740. Capacity: 250mL. Tolerance +/-: 2mL. Stopcock Style: Straight Bore Teflon. Stopcock Bore No. : 4. Height: 550mm (approx). Outer Diameter: 33mm (approx). Corning #: 2094-250. This 500mL Corning Pyrex graduated buret is suitable for use in school and institutional laboratories not requiring the accuracy of our Class A model. Buret is used for dispensing large volumes of liquids rapidly and accurately. Made from close tolerance, accurate bore tubing with uniform walls, this buret has a permanently colored scale. Equipped with a PTFEstopcock plug to reduce freezing and eliminate lubricant contamination. The smooth micro-finish of the stopcock barrel assures a precision fit and optimum leak-resistant performance. Material: Borosilicate Glass Code 7740. Capacity: 500mL. Tolerance +/-: 2.5mL. Stopcock Style: Straight Bore Teflon. Stopcock Bore No. : 4. Height: 675mm (approx). Outer Diameter: 41mm (approx). Corning #: 2094-500. 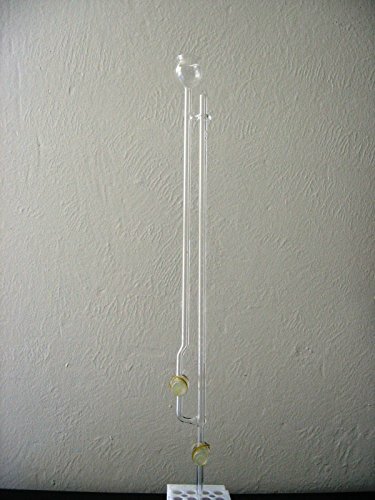 This 10mL Corning Pyrex buret is perfect for schools and institutional laboratories not requiring the accuracy of our Class A model. A PTFEstopcock plug reduces freezing and lubricant contamination. The microfinish of the barrel provides a precision fit. The tip is carefully drawn for accuracy to insure proper drainage rates. Each buret is supplied with a dust cover and has a permanently colored scale. Furnished with a 2mm bore stopcock plug. Material: Borosilicate Glass Code 7740. Capacity: 10mL. Tolerance +/-: 0.04mL. Stopcock Style: Straight Bore Teflon. Stopcock Bore No. : 2. Height: 560mm (approx). Outer Diameter: 9mm (approx). Corning #: 2122A-10. 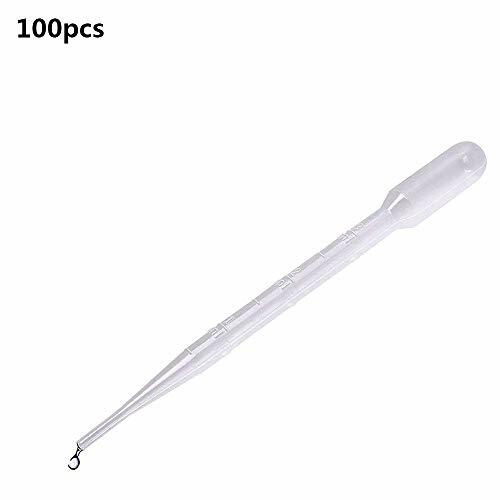 1000mL Large size burette used for dispensing. PTFE stopcock for all sizes is 4 mm bore size. Scale is durable white ceramic enamel. 10mL Subdivisions. 2 Each/Case, Kimax. This 1L Corning Pyrex graduated buret is suitable for use in school and institutional laboratories not requiring the accuracy of our Class A model. 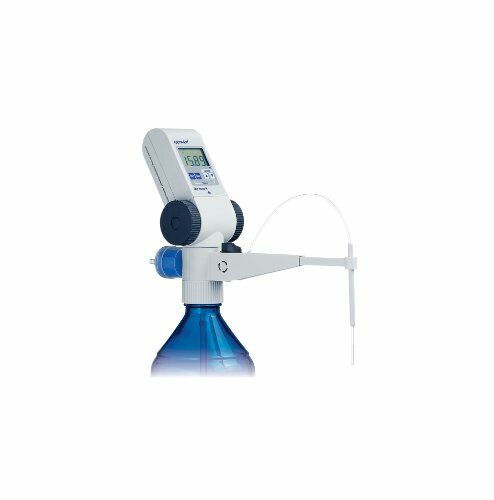 Buret is used for dispensing large volumes of liquids rapidly and accurately. Made from close tolerance, accurate bore tubing with uniform walls, this buret has a permanently colored scale. Equipped with a PTFEstopcock plug to reduce freezing and eliminate lubricant contamination. The smooth micro-finish of the stopcock barrel assures a precision fit and optimum leak-resistant performance. Material: Borosilicate Glass Code 7740. Capacity: 1000mL. Tolerance +/-: 5mL. Stopcock Style: Straight Bore Teflon. Stopcock Bore No. : 6. Height: 810mm (approx). Outer Diameter: 50mm (approx). Corning #: 2094-1L. The innovative Top Buret from Eppendorf sets new standards for manual titration. A new, pulse-free dispensing technique allows the desired volumes to be dispensed continuously, thus eliminating the need for new liquid aspiration each time. 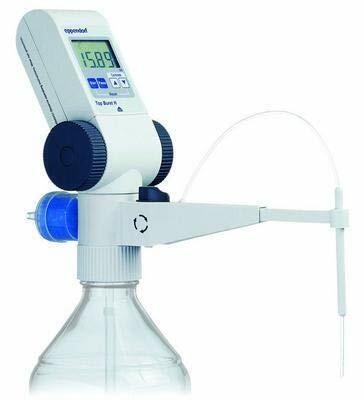 This makes titration simpler and safer, with precision values well within required limits. 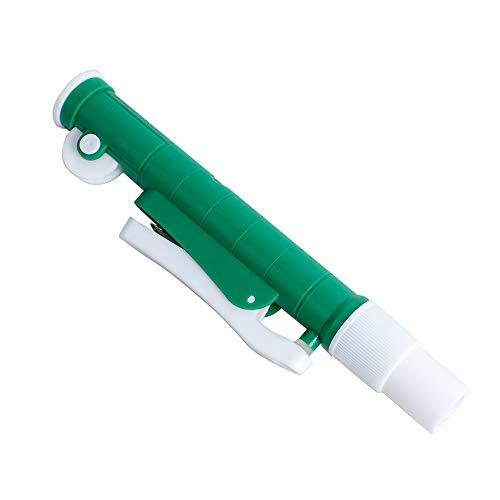 500mL Large size buret used for dispensing. PTFE stopcock for all sizes is 4 mm bore size. Scale is durable white ceramic enamel. 5mL Subdivisions. Kimax. 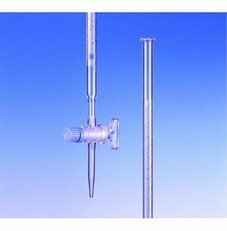 This 100mL Corning Pyrex buret is perfect for schools and institutional laboratories not requiring the accuracy of our Class A model. A PTFEstopcock plug reduces freezing and lubricant contamination. The microfinish of the barrel provides a precision fit. The tip is carefully drawn for accuracy to insure proper drainage rates. Each buret is supplied with a dust cover and has a permanently colored scale. Furnished with a 2mm bore stopcock plug. Material: Borosilicate Glass Code 7740. Capacity: 100mL. Tolerance +/-: 0.2mL. Stopcock Style: Straight Bore Teflon. Stopcock Bore No. : 2. Height: 752mm (approx). Outer Diameter: 18mm (approx). Corning #: 2122A-100. This 25mL Corning Pyrex buret is perfect for schools and institutional laboratories not requiring the accuracy of our Class A model. A PTFEstopcock plug reduces freezing and lubricant contamination. The microfinish of the barrel provides a precision fit. The tip is carefully drawn for accuracy to insure proper drainage rates. Each buret is supplied with a dust cover and has a permanently colored scale. Furnished with a 2mm bore stopcock plug. Material: Borosilicate Glass Code 7740. Capacity: 25mL. Tolerance +/-: 0.06mL. Stopcock Style: Straight Bore Teflon. Stopcock Bore No. : 2. Height: 560mm (approx). Outer Diameter: 12mm (approx). Corning #: 2122A-25. 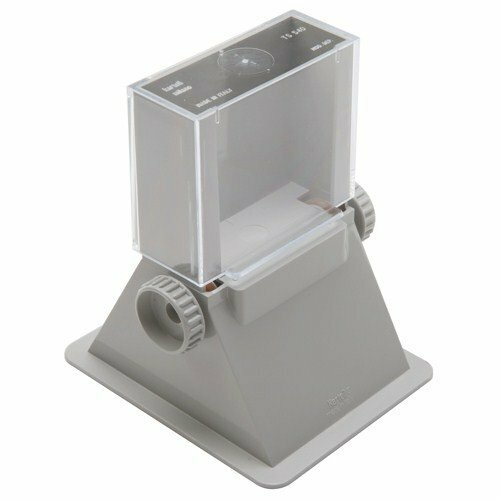 Automatic Slide Dispenser holds approximately 50 standard 3 x 1 (76 x 26mm) slides in transparent, dust-free container. By turning either side knob, the slides are ejected one at a time. 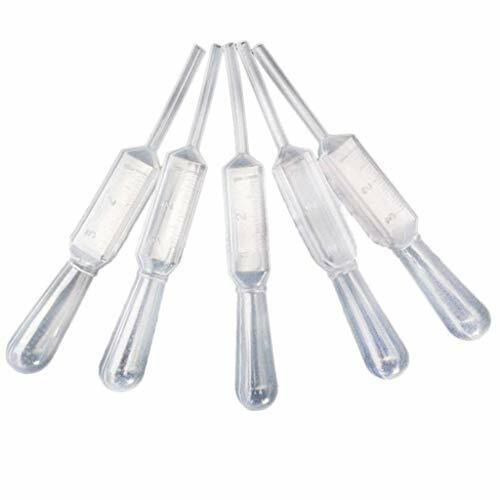 These laboratory grade, Class B, borosilicate glass burets are useful for dispensing larger volumes without refilling. The straight stopcock has a PTFE plug. Scientists rely on the expertise and artistic skills of Wilmad-LabGlass' engineers and glass specialists to manufacture NMR and EPR consumables and laboratory glassware of the highest quality. Used daily in academia, healthcare and chemical, petroleum and other industrial applications, Wilmad offers 7000+ items as part of their standard catalog as well as custom fabrication for individual glassware, glass repair services and OEM glass parts. made of borosilicate . size5ml :scale division 0.02ml.730mm length.